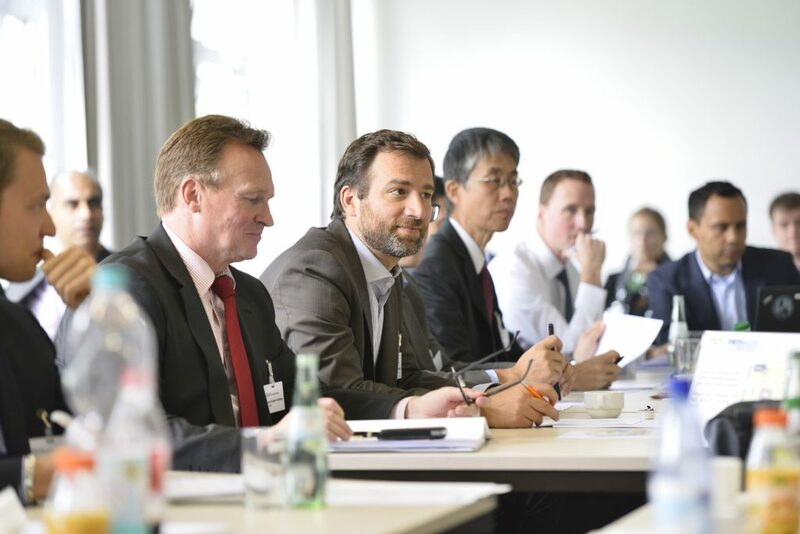 We organize workshops and workgroups providing a detailed insight to the industrial and scientific state of the art by industrial and scientific presentations and extensive discussions. AZL Workgroups are an integral part of the AZL Partnership and are jointly defined at the AZL Annual Partner Meetings by the AZL Partner Companies. 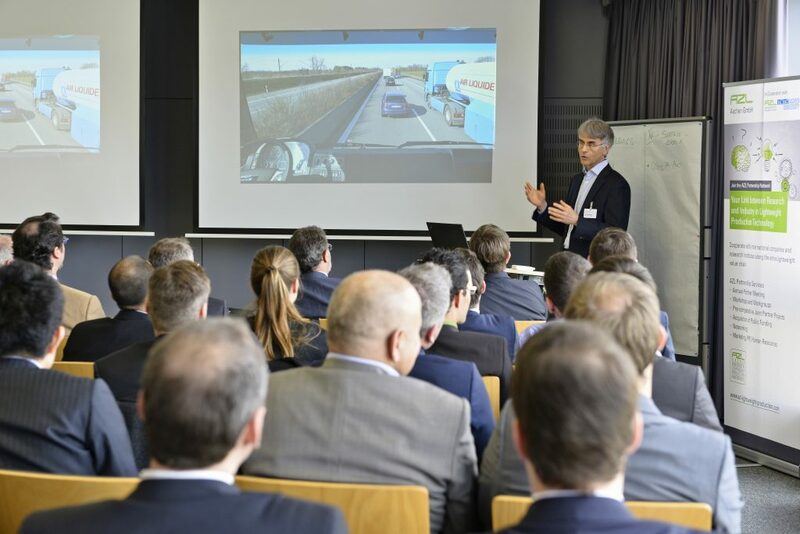 On a six-month cycle, approximately 20 companies and several representatives of AZL Partner Institutes meet to work on specific pre-competitive technology challenges. Thermoplastic composites become increasingly popular in cost-driven industries due to short cycle times and recycling opportunities. Production processes combining continuous and short or long fiber reinforcements allow a high design flexibility as well as good mechanical properties at the same time. Thus, overmolding of FRP inlays is a popular process to refine and functionalize thermoplastic semi-finished products. This workgroup continuously works on the consolidation of the high-potential overmolding technology of thermoplastic FRP inlays for series production. 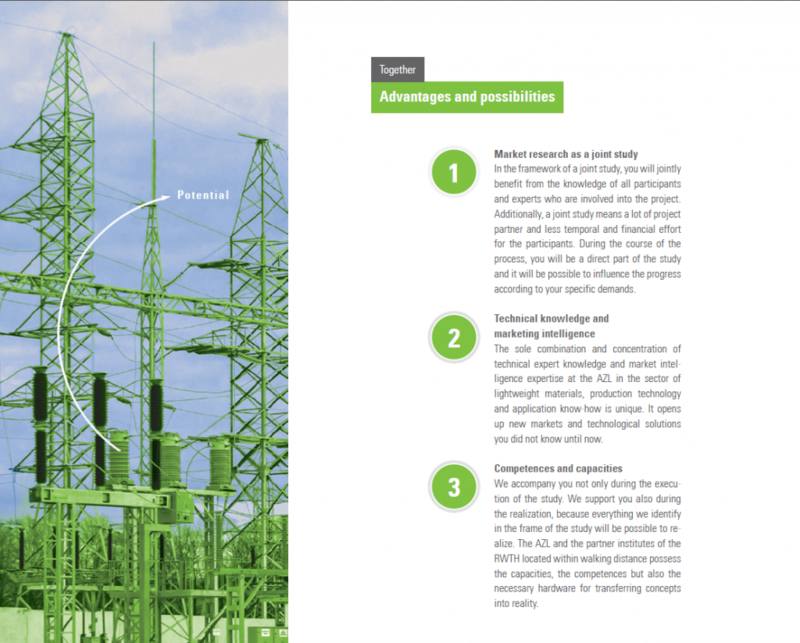 For this purpose, knowledge exchange, technology screenings, focused investigations as well as system benchmarks advise a selection of cost-optimal materials and processes. 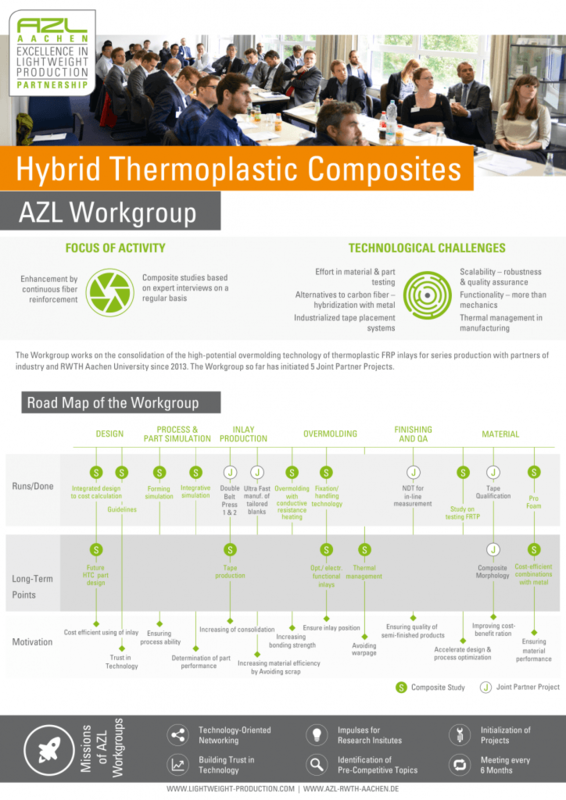 All AZL Partner Companies involved in the value chain of thermoplastic composites are represented at our Business Platform “Thermoplastic Composites”. We are expanding the established Workgroup “High-Speed RTM Matrices” to the new Workgroup “Advanced Thermoset Production”. The extension is motivated by numerous innovations in the area of thermoset processes which can only partly be covered by the so far Workgroup Focus on RTM. 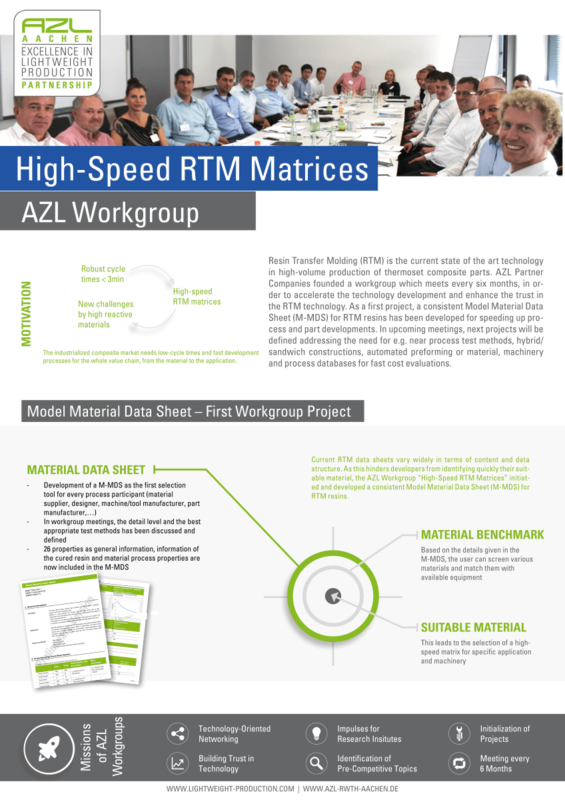 The former RTM Workgroup “High-Speed RTM Matrices” was founded by the AZL after three Workshops on “High-Speed RTM Matrices” in which the AZL partners expressed the interest to continue to work on this topic. The aim of the Workgroup was the standardization of RTM material data sheets, the needs for high reactive material test methods. The quality assurance possibilities in the RTM process were also defined. 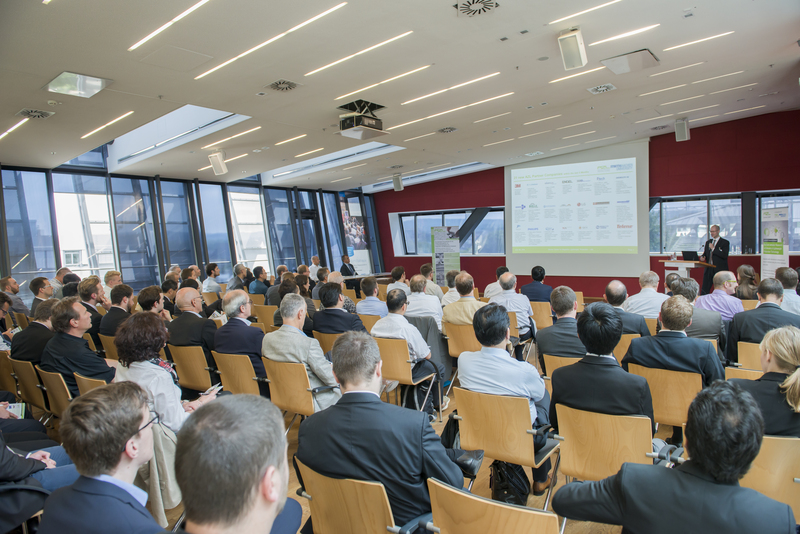 With three Workshops and five Workgroup Meetings concerning “High-Speed RTM Matrices” we are looking back to a successful Workgroup that is now extending its topics. 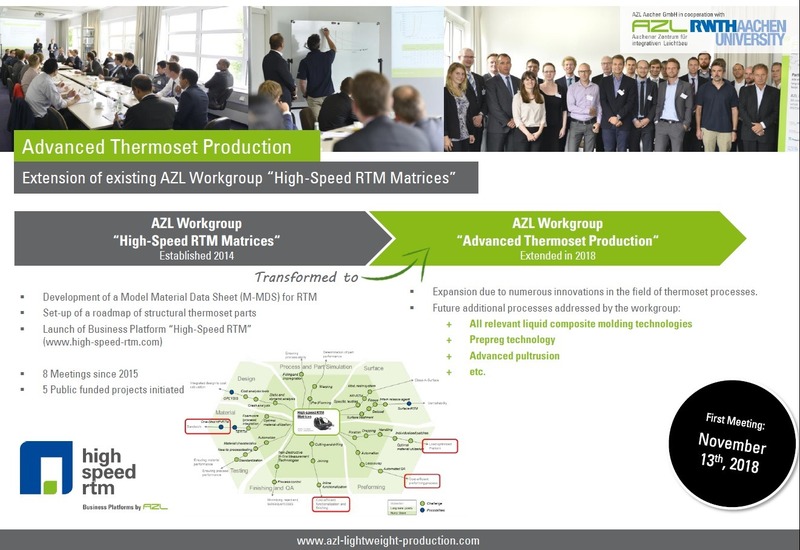 All AZL Partner Companies involved in the value chain of High-Speed RTM are represented at our Business Platform “High-Speed RTM”. Download the Flyer with all the information on the Workgroup “Advanced Thermoset Production”. Pipes and Vessels made of composites offer high potential to improve production technology, for example concerning cycle time and material efficiency. Missing standards of testing methods and pre-product attributes as well as a lake of know-how on the long-term material performance require joint research and development activities. The AZL workgroup which was founded in 2015 addresses these needs with the development of a generic pressure vessel. 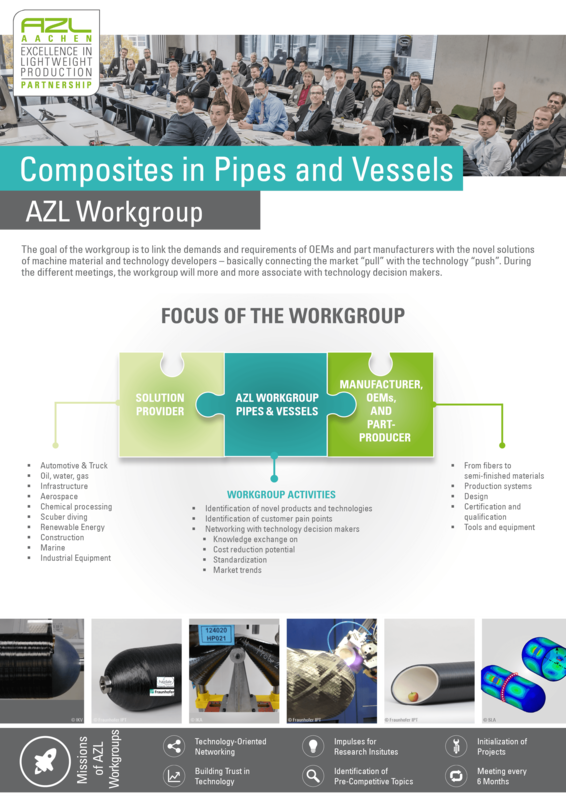 All AZL Partner Companies involved in the value chain of Composite Pipes and Vessels will be represented soon at our Business Platform “Composite Pipes and Vessels”. SMC (Sheet Molding Compound) is for many years a proven and first choice solution for replacing metal parts. The drive to further weight savings and significant reduction in CO2 emissions require a next generation of High-Performance SMC with short and continuous fiber reinforced systems using both carbon and glass fibers with customized resin compounds. Class-A body panels and semi-structural parts for automotive and various industrial applications are the key target for high-performance SMC. Within an initial workshop, participants defined material characterizations of various SMC types, methods for fast and re-liable pre-design of components and processes, an improved bonding of reinforcing fibers to the resin matrix as well as the development of new resins as most important subjects for future research and development activities. 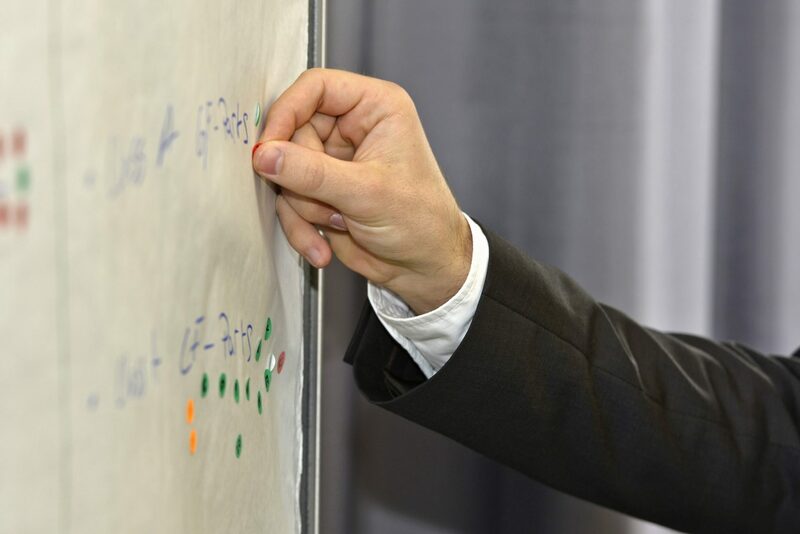 To continuously work on these subjects, a workgroup between research institutes and AZL Partner Companies has been established in in February 2016. 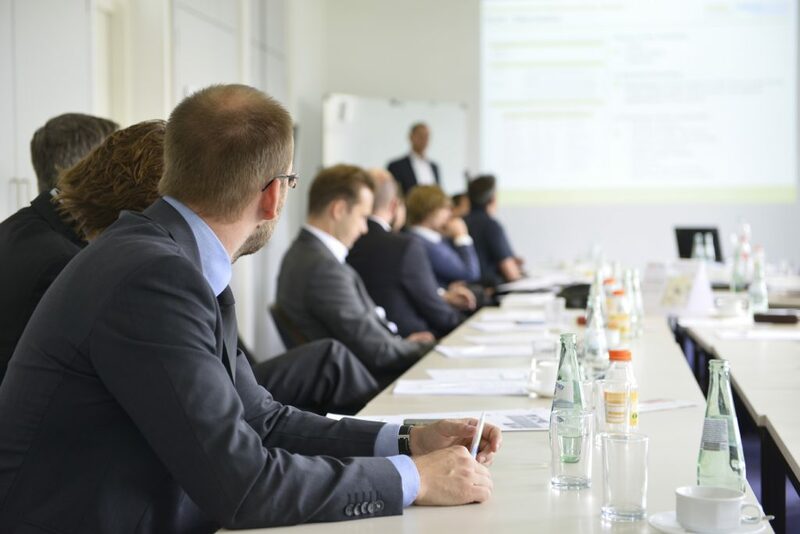 To participate in this workgroup several new Partner Companies recently joined the AZL Network such as Menzolit, Polynt, A. Schulman, Aliancys. 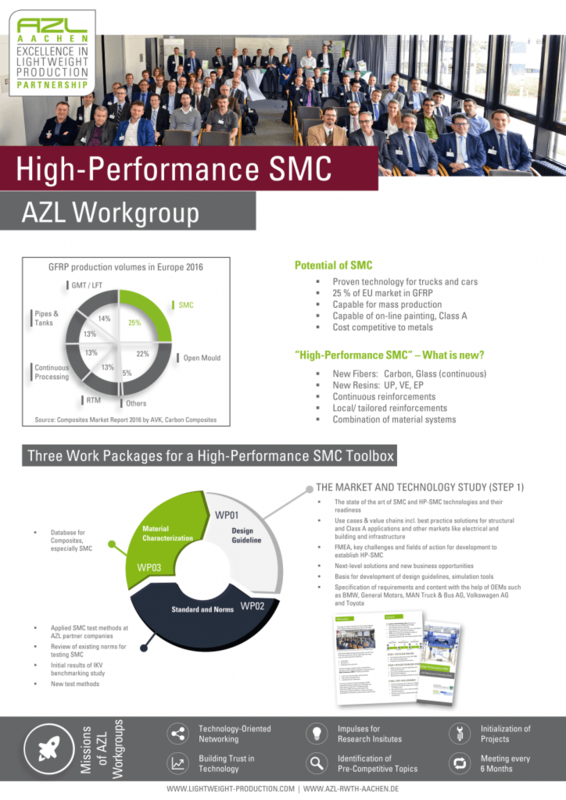 All AZL Partner Companies involved in the value chain of High-Performance SMC will represented soon at our Business Platform “High-Performance SMC”. 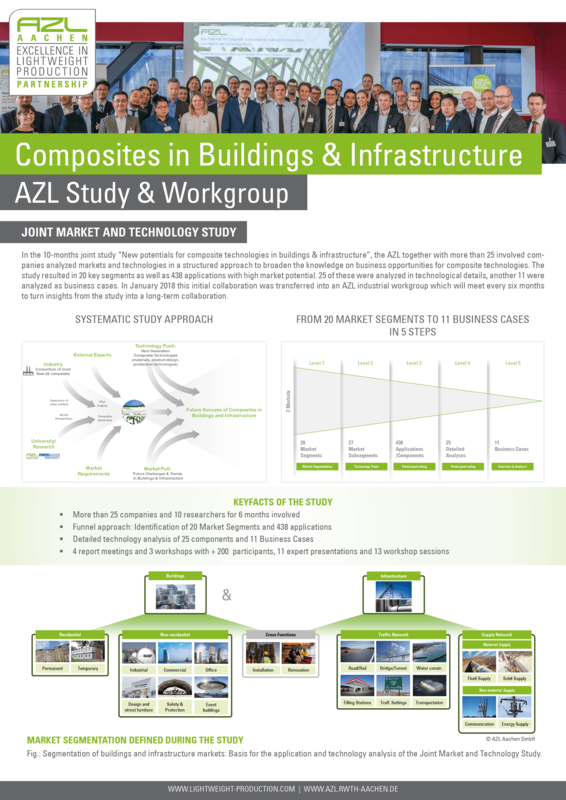 After the completion of the AZL Market and Technology Study addressing new Potentials for Composite Technologies in Buildings and Infrastructure, the AZL will implement a workgroup with regular meetings to enhance business cooperation and to realize applications with the highest market potential. Click here to read Testimonials to this study. 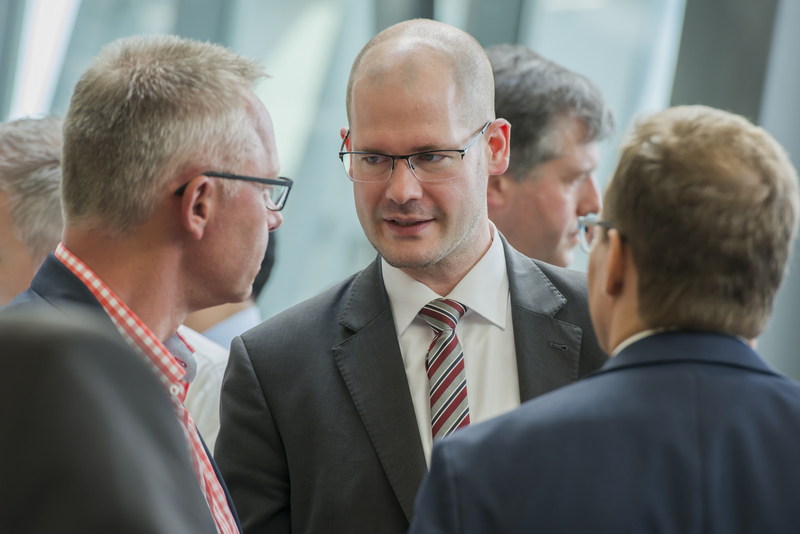 After the first branch-independent AZL Market and Technology Study, the AZL Partner Network works on identified challenges and promising technologies within several workshops. Some of these workshops developed into workgroups or Joint Partner Projects. Joining technology is one of the key enablers for the large scale use of fiber-reinforced plastics (FRP). Due to the material-specific properties of fiber-reinforced plastics, joining is a major challenge. Within two workshops, the AZL provided a technology overview, new approaches of joining FRP as well as application oriented joining solutions. 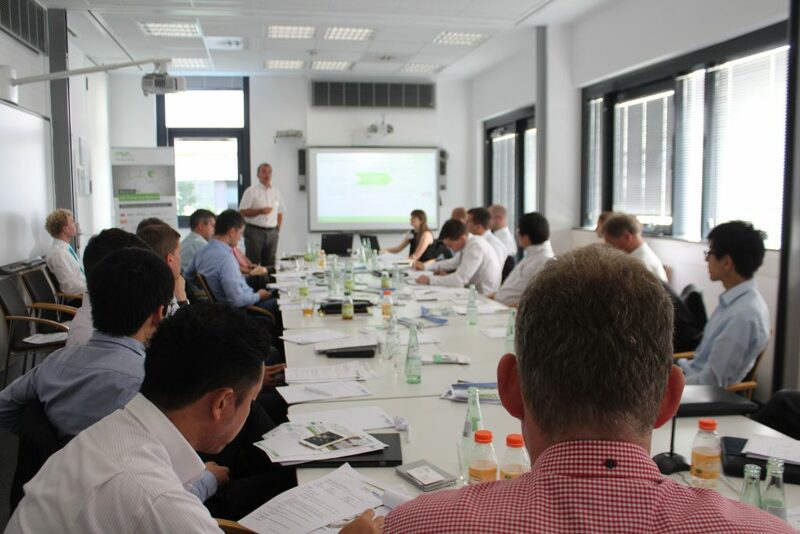 Within a workshop, the AZL addressed the processes which are involved from the designing and planning of a lightweight component to the finished component. 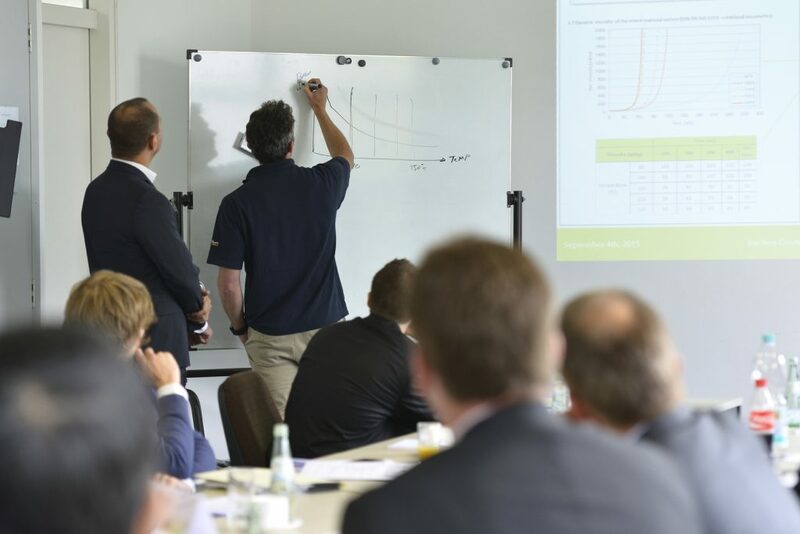 The aim was to define the information which is needed at the different stages of the value chain and on that basis to establish universal guidelines for designing, dimensioning as well as for the production planning of composites components. As identified in the AZL Market and Technology Study, the high cost of composite parts prevent the market penetration in various branches. For complex parts, which are produced in various process steps, the cost structure depends on different factors in the process chains, which are not easily identified. 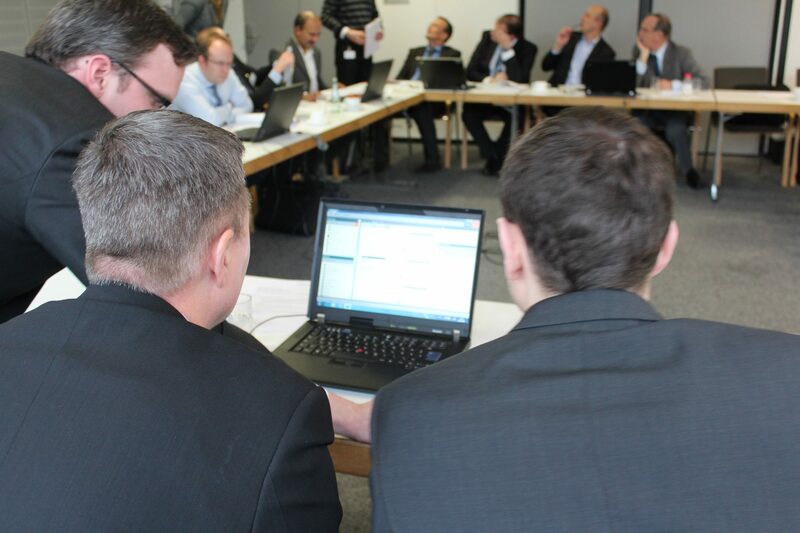 The workshop aimed to model and to analyze process chains regarding the cost structure of composite parts. 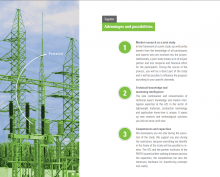 By this analysis, the bottlenecks of the process chain can be identified and technical solutions can be derived with a cost saving potential. The process cost analysis in this workshop as well as in different AZL projects is conducted with OPLYSIS® – the intuitive drag & drop workspace for process chain modelling, cost structure calculation and automated identification of cost and time Drivers developed by AZL and Conbility. The workshop was conducted to precise the needs of the AZL partners for an easy access to the content of public funded research projects and corresponding research institutions. 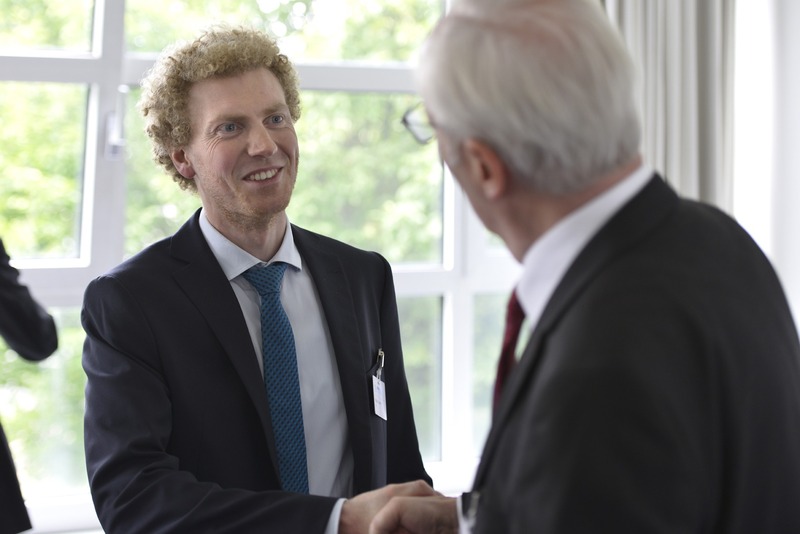 As a partnership included service, the AZL has developed a research database for all public funded projects on lightweight related topics in Aachen. AZL Partner Companies can access this database in the AZL Partner Section. You belong to one of AZL’s Partner Companies and would like to register for a Workgroup Meeting? Visit the AZL Partner Section and register for your meeting. You are an AZL Partner? details in our Partner Section.